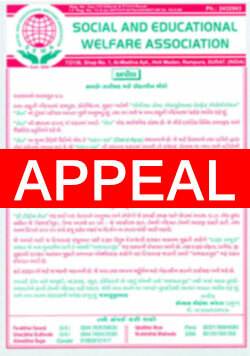 Help us and come forward to build up a reading Room for student & An Old - Age Home. This letter is on behalf of Social and Educational Welfare Association, SEWA, as we call it. This is to convey that our organization has, usual, come forward to extend our support and patronage to people who are ailing. SEWA is a government recognized trust. We provide Notebooks to the students on concessional rates and also free of cost to the poor students. We provide free food kits of poor families in Ramzan and Diwali. We also encourage and provide guidance for higher education and also run English Classes. For a long time, your company has been associated with us in undertaking all such activities. This time also, we request you to be profuse in your generosity. The task on hand is not a simple one. It requires a huge sum of money. Social and Educational Welfare Association, SEWA, as the name suggests would provide shelter to any citizens over 65 years of age; of our religion, and those who are needy, without shelter, without guardians and in need of care and attention. It would provide shelter to those who have been recommended by the concerned bodies for shelter at the Residence and those who commit to abide by the rules and regulations of the residence committee. Apart from food, shelter, and clothing the people would be provided health services and religious and entertainment programs for the residents as well as make arrangements for the cremation of any of the residents upon their. It is also a need of our community. Hence, we appeal to all you donors and humbly request you to contribute your level best generously towards this noble cause. In future, we are planning to help the weak students of the society by providing them with a room for studying. We always look towards you to please donate generously for a just cause. For the above both projects needs a wide land and considerable amount for money. I write to you on behalf of our youth who are hoping to utilize this room for studying. The room will be used for their regular studies. We are knocking on your kind heart to help us raise funds for the said purposes. Whatever help you can extend us will go a long way in helping spread the good news of you people’s generosity towards your brethren. If you wish to send us any amount, you may contact us at 0261 2432936 or 919979200311 or 919427133197 or approach us directly at the Social and Welfare Association (SEWA) office, Rampura Chhadaole, Surat, India. Thank you and may ALLAH Bless you always.